Last night, after President Obama delivered his fourth State of the Union address to Congress, Florida Senator Marco Rubio, whose place in the GOP has become more prominent after Mitt Romney received the lowest support for a Republican presidential candidate among Hispanic voters since 1996, took the stage to give the Republican response. But despite the spotlight on Rubio, public opinion data shows that Republicans and Hispanic Americans tend to disagree on the issues mentioned in the President’s address and Rubio’s response. Surveys show a deep fissure between Republicans and Hispanic Americans on economic issues, which formed the backbone of Obama’s speech and Rubio’s well-articulated rejoinder. While 7-in-10 Hispanics favor increasing taxes on Americans making over $250,000 per year, over 6-in-10 (62%) Republicans oppose this policy, which President Obama repeatedly touted on the campaign trail. 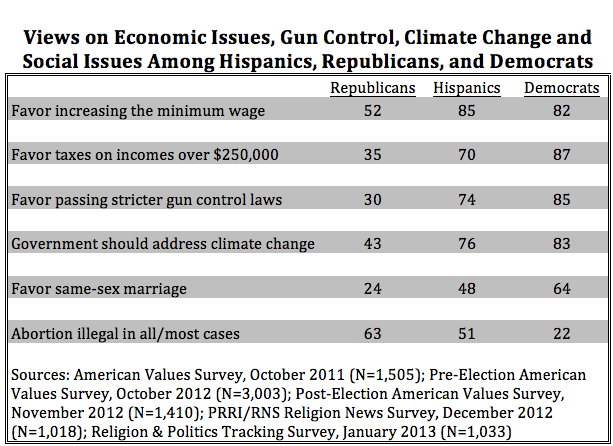 Hispanics and Republicans also disagree on how to foster economic growth. In a choice between lowering taxes and public investment, 4-in-5 (80%) Republicans prefer lowering taxes and spending cuts, while two-thirds (67%) of Hispanics prefer spending on education and infrastructure while raising taxes on the wealthy. Meanwhile, on the minimum wage there is a notable intensity gap: only a slim majority of Republicans (52%) favor this proposal, compared to more than 8-in-10 (85%) Hispanic Americans. Even on social issues, which have traditionally been seen as a place where Republicans and Hispanic Americans have more common ground the two groups are not necessarily aligned. More than 6-in-10 (63%) Republicans believe abortion should be illegal in all or most cases, compared to a slim majority (51%) of Hispanic Americans. And while 7-in-10 (70%) Republicans oppose allowing gay and lesbian couples to marry legally, Hispanic Americans are nearly evenly divided on the issue (48% favor, 44% opposed). These deep divisions in policy and issue preferences between Hispanics and Republicans suggest that increasing support for Democratic candidates among Hispanics since 2004 is not just about Romney, Obama or the GOP’s position on immigration. For the GOP to attract more Hispanic voters, visible Hispanic leaders are an important first step, but will likely remain insufficient if Hispanics and the GOP remain far apart on many of the important issues of the day.